When I’m looking for a quick fruit treat, this Cherry Filo Pastry Tart is a firm favorite. With the first bite, the buttery and crispy crunch of the filo pastry enthusiastically greets your tastebuds. And within a split second, you are meeting the sweet jammy cherry filling. Opposites attract. That’s the term to describe this Cherry Filo Pastry Tart. The crispy filo pastry cuddles the jammy cherry filling inside. The almost savory buttery (or olive oil) scent of the filo pastry hits your nose right before the sweet sticky cherry filling follows behind. 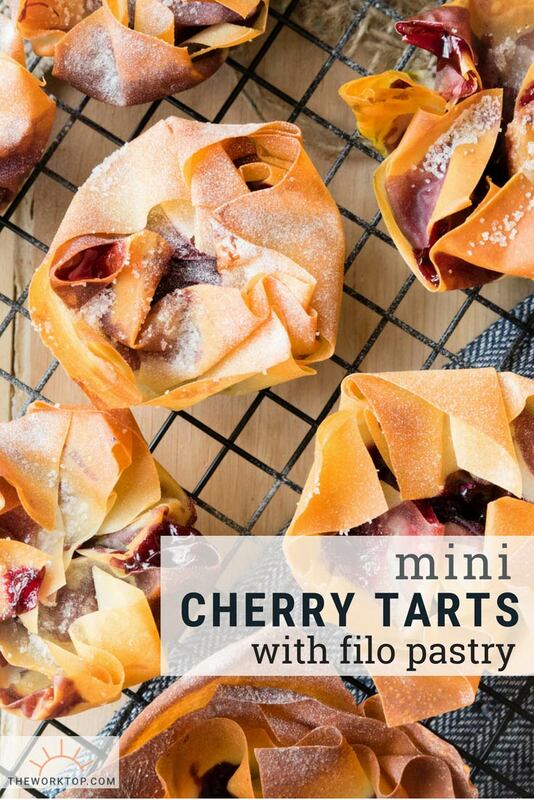 Cherry Filo Pastry Tarts can be a portable grab ‘n go breakfast, snack or healthy dessert (I must admit, I’ve had it for all three of those meals in the same day). 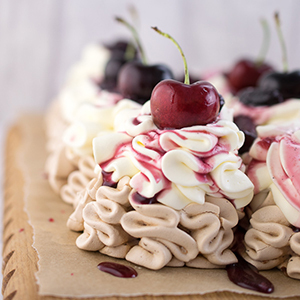 It’s quick and easy to make, and you can even prepare the cherry filling the night before to save time on the day of baking. You can make these Cherry Filo Pastry Tarts vegan and healthier by simply using olive oil to brush the filo pastry sheets, instead of butter. 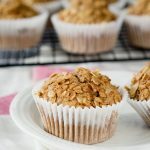 It’s also an egg-free recipe, in case you’re looking for an allergy-friendly treat. I keep finding myself using filo pastry where traditionally a puff pastry might be used, and loving the result. 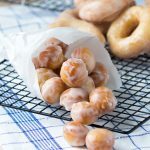 Filo pastry is really easy to work with and though it might look a bit more daunting, I often find that it takes the same amount of time as using a pre-made puff pastry sheet. Though it takes a few extra seconds to brush butter or olive oil on each of the filo pastry sheets, you don’t have to finish off filo pastry with an egg wash, as you would with a puff pastry sheet. A simple brush of butter or olive oil on the filo pastry sheets will give it a nice golden brown in the oven. 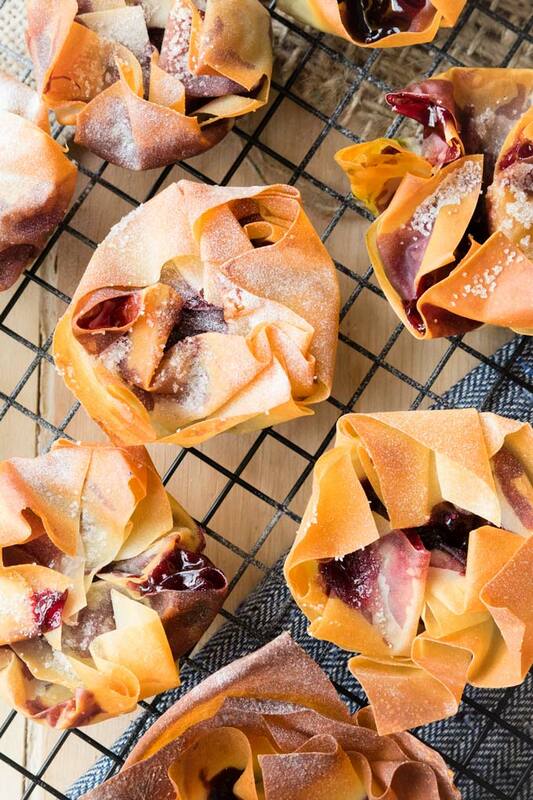 For these Cherry Filo Pastry Tarts, each muffin cup is layered with 2 filo pastry sheets. You cut the filo pastry into squares first, then brush the front and back of each square with butter or olive oil. Then you lightly layer the cut and buttered filo pastry into the muffin holes, so the corners of the two sheets are not aligned. When you are ready to fold the filo pastry edges over the cherry filling, do so with a gentle touch and make sure you only loosely close the tart. 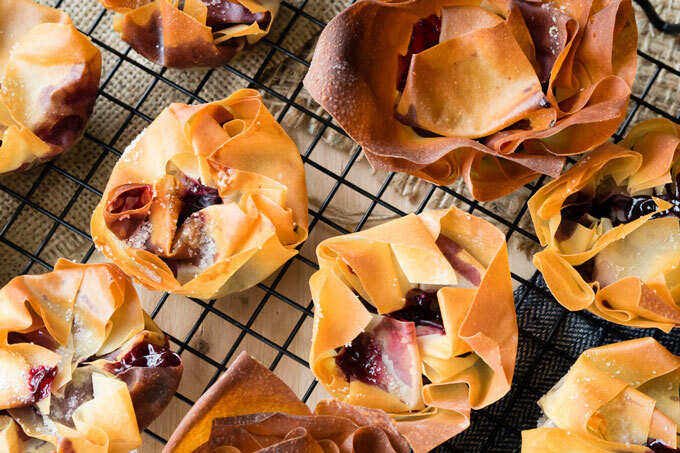 By doing so, these Cherry Filo Pastry Tarts will keep a delicate appearance. 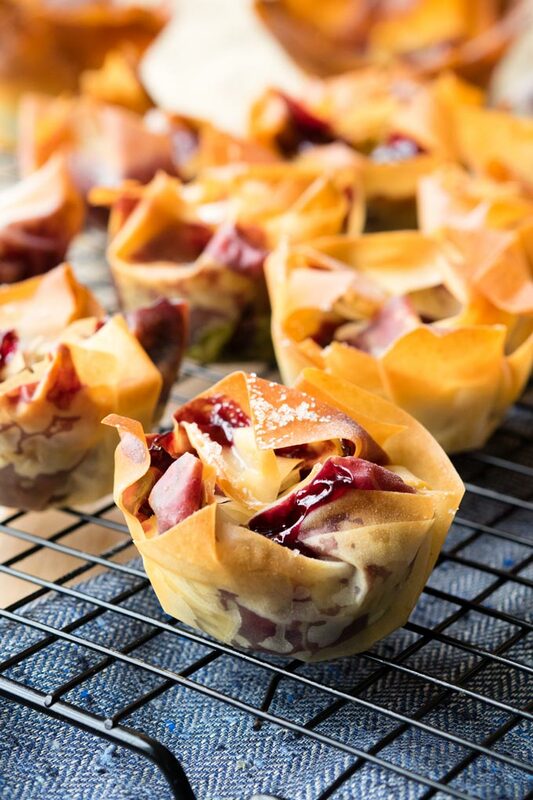 If you are looking for something more dramatic, you could fold one filo pastry sheet over the cherry filling, and leave the other filo pastry edge up, so it makes more of a tulip shape. 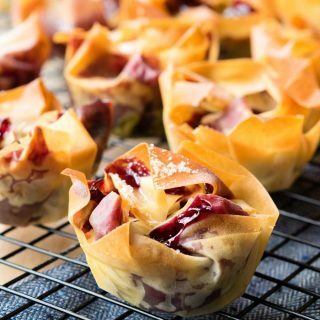 These tarts definitely catch the eye when folded that way, however, the tips of the filo pastry may brown much faster than the bottom of the tarts, leaving you with a bit of ombre browning. 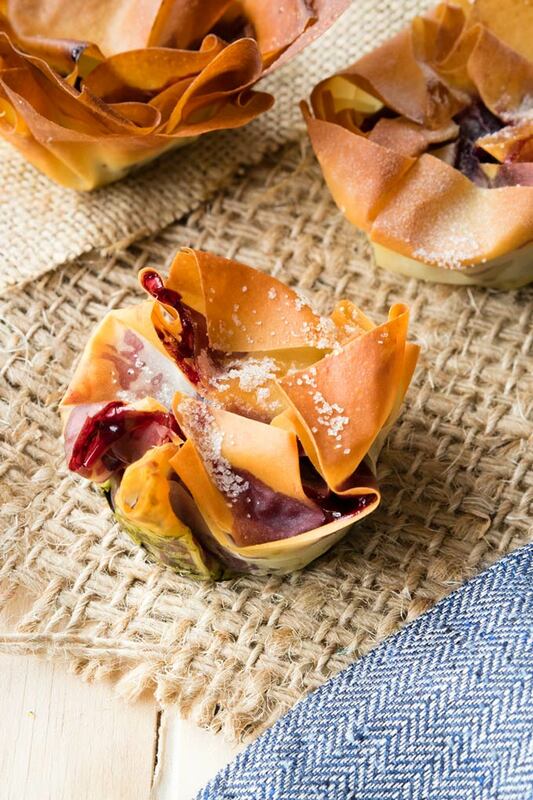 To mitigate the extra browning on the filo petals, lower your oven rack, or use a convection setting in the oven to keep the hot air circulating evenly. That will help prevent the tops from browning as fast, but you still will have ombre filo pastry tarts. How fashionable! One thing you may note about this Cherry Filo Pastry Tart recipe is that it relies on arrowroot powder to thicken the cherry filling. 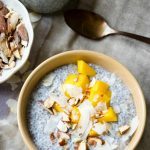 Arrowroot powder isn’t as widely used as cornstarch, so unless you are a seasoned baker and cook, you may not have it in your pantry. If that’s the case, you can use cornstarch in a pinch. 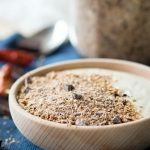 But arrowroot powder is a great pantry staple to have, so you might as well go pick some up. Arrowroot powder gives the final cherry filling a beautiful glossy shine, whereas cornstarch can sometimes leave a sauce cloudy looking. Arrowroot powder is also very neutral in taste, so you won’t be left with any unwanted flavors. I hope you enjoy this recipe for Cherry Filo Pastry Tarts. 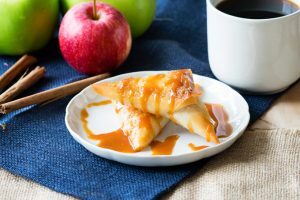 If you are looking for other filo pastry recipes, here’s a recipe for Caramel Apple Turnovers made using filo pastry. 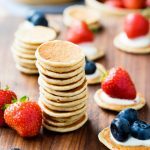 Cherry Filo Pastry Tarts is a portable grab 'n go breakfast, snack or healthy dessert. 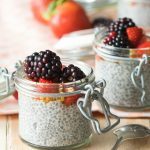 It's quick and easy to make, and you can prepare the cherry filling the night before to save time on the day of baking. 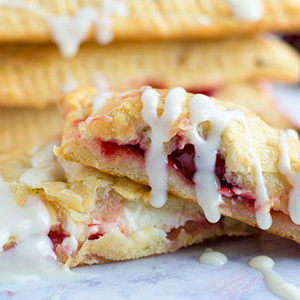 These Cherry Filo Pastry Tarts can be made vegan and healthier, and it's an egg-free recipe. In a medium saucepan on medium heat, add the frozen cherries, sugar, vanilla and salt. Cook for about 5 minutes, stirring frequently, until the cherries release their juices and the mixture is hot. 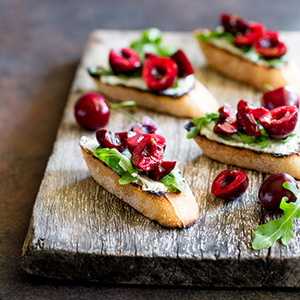 Gently break apart cherries with a spatula. As the cherries are cooking, in a small bowl, mix together the arrowroot powder and water to form a sludge. 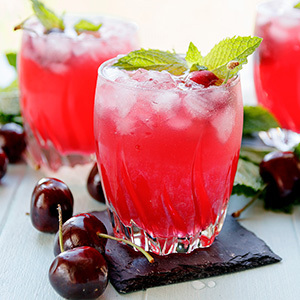 When the cherries are ready, add the arrowroot mixture into the saucepan, stirring as you pour it in. Bring everything to boil and immediately remove from heat. 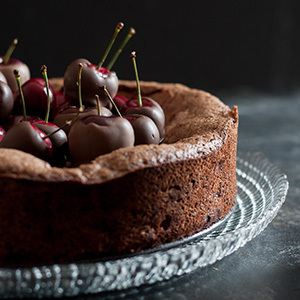 Allow the cherry filling to cool to room temperature. Preheat oven to 375°F / 190°C. Use a non-stick muffin pan and lightly oil the muffin cases. Cover the filo pastry sheets with a damp kitchen towel until ready to use. Cut each filo pastry sheet into 4 squares (it does not have to be precise). Each sheet will likely produce a strip of leftover rectangular filo pastry. 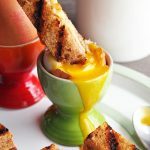 You can use the leftover scraps also. Lightly brush the filo pastry on each side with butter and line 2 sheets in each muffin case, allowing for irregular edges. If you would like, you can also line the tins with the leftover scraps, though there likely won't be enough to line all the muffin cups with a third layer. 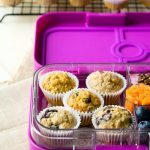 Fill each muffin tin with 1 tablespoon of the cherry filling (I find using a small cookie scoop is the quickest way to do this). Gently fold the filo pastry edges over the top of the cherry filling, so you loosely close up the filo pastry tarts. Brush the top of each tart with additional butter. Bake for 10 - 15 minutes, until the filo pastry looks a light golden brown all over. Remove from heat and allow to cool in the tin for a few minutes before transferring to a cooling rack. The cherry filling inside will be very hot when it comes out the oven. Once cooled, dust with powdered sugar. A standard box of filo pastry sheets here contains 227 grams (7 sheets), which is what I used in the recipe to make 12 Cherry Filo Pastry Tarts. However, the standard box size for different brands in different countries may vary, so you may end up with a box with more filo pastry. The recipe for the cherry filling is inspired by Sally's Baking Addiction. 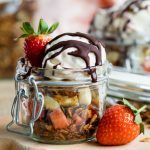 I teamed up with a group of food bloggers to share recipes made with cherries this month! 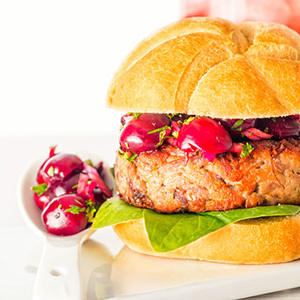 Enjoy these other recipes that feature cherries. This is the first time I am hearing about Filo Pastry, Tina! However, this recipe seems very easy! Can I use fresh cherries? Yes, should be no problem to use fresh cherries. Just make sure they are pitted first. I hope you enjoy the recipe and the filo! What an interesting recipe. It looks amazing! I bet it’s also very delicious. I’m going to try it this weekend, can’t wait! !